Lay the clean, drained berries in a single layer on a cookie sheet and place in the freezer until frozen through. It is best to do both this and the next step the day or night before you plan to make the sorbet - just make sure you leave enough time for everything to freeze. Make the herb-infused simple syrup by combining the water and sugar in a small heavy-bottomed saucepan and heat over a medium flame until it comes to a boil. Turn it off and let cool completely. 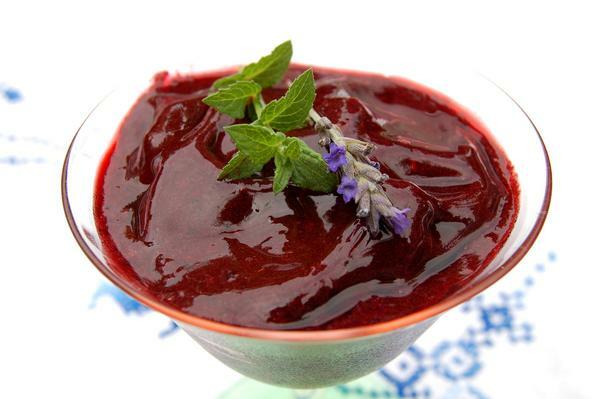 Once the berries and herb-infused syrup cubes have frozen, you can make the sorbet. Place the frozen berries and syrup cubes in the bowl of a cuisinart or blender and add a few teaspoons of ice water to aid in blending. Continue to process or blend, adding small amounts of the ice water as needed, until smooth. Serve, topped with a sprig of mint leaves and/or lavender. I grew up in the lush countryside of New York's Hudson River Valley. As a little girl, picking the wild blackberries that grew down the street from my house was one of my favorite things to do in the hot, hazy days of late summer. My friend, Emily, shared my enthusiasm for the berries and she would come over to play "blackberry factory" with me -- a game that was as simple and delicious as it sounds. We would wander down the road from my house, stopping every few feet to pop the black bubbles of tar that had formed in the heat. When we finally reached the bramble, we'd steal ourselves for a moment then plunge into the thick patch of blackberry canes, doing our best to avoid the thorns. The berries were abundant -- there were always plenty to bring home even after stuffing ourselves. Despite the rather capitalist sounding name we'd chosen, picking blackberries was one of the sacred rituals of summertime. Unfortunately, in the decades since I left home my life as a city-dweller has not offered me many opportunities to pick berries. So I was delighted to discover upon moving to the East Bay a few years ago that blackberries flourish in many parts of this urban environment. Yesterday, we joined our good friends for a picking expedition in their Oakland hills neighborhood. The steep, dry hillsides are covered in blackberries -- the canes seem to favor the rarely used public stairways that provide a shortcut through the hills. We started out with clean hands and empty buckets and worked our way through the neighborhood, relieving the canes of their ripe berries as we went. We picked in peace with only a few curious and amused glances from passing drivers and returned an hour later with our hands stained purple, our arms scratched, and our buckets brimming with blackberries! Back at the house, we washed the berries carefully to remove the dust and dislodge the little bugs we'd carried home. When they'd drained, we laid the berries out singly on cookie sheets -- by far the easiest way to prepare them for freezing. Once frozen, you can use a metal spatula to simply scoop them off the tray into a ziplock bag or other container and then pop them back in the freezer to be used for smoothies, sauces, etc., whenever you want them. My husband had made a simple yet delicious blackberry sorbet after similar picking expeditions last summer and we were eager to make our first batch of the season. But this time, I decided it would be fun to experiment with adding some fresh herbs from our garden-- mint and lavender. After freezing the berries, the next step was to infuse the mint and lavender I'd picked into a simple syrup of organic sugar and water. After the syrup had cooled, I strained the herbs out and poured the liquid into an ice cube tray which then joined the berries in the freezer. Once the berries and the herb-infused syrup cubes were fully frozen, we were ready to create this divine, locally foraged dessert. We poured some berries and a few cubes of simple syrup into the cuisinart, added a little water and processed until smooth - all of which took less than five minutes. We sat back to appreciate our creation. The wild blackberry sorbet was a breathtakingly beautiful purple (J.Crew's colorists might call it either "burgundy" or "cabernet") and the taste was no less breathtaking - cool and smooth, sweet yet tart, with subtle notes of lavender and mint. The simple recipe is below - feel free to make slight adjustments to taste. Enjoy!